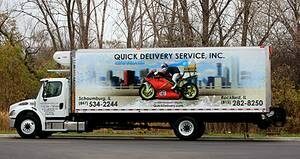 Quick Delivery Service Inc – Established on September 30, 1983 by Randy Seiler whom to this day still remains owner and CEO of this Chicago based courier / messenger company. From humble beginning’s where Randy was the sole employee, Quick Delivery has steadily grown into your ‘go-to’ courier in Chicago with over 100 employees to service all of your package needs. Courier and messenger services including rush non-stop direct, 2 hour, 3 hour and cost effective same day delivered by 5pm if picked up before 11 am. Vast range of vehicles to suit all types of goods. Able to deliver Chicago Local and United States wide. Next flight – Airfreight to United States and Canada. Air charter service where you can hire the whole aircraft for your special delivery needs. Warehousing, Distribution and trucking services. Pallet and tailgate lift equipped trucks for pick up and delivery points that do not have suitable loading docks, forklifts etc. Online payment via credit card, major cards accepted. Note: You are welcome to leave your own review of this company via our comments section – see below map.